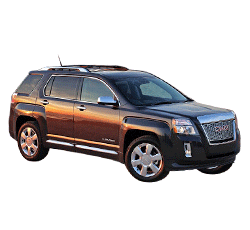 The 2015 GMC Terrain is a stylish SUV that brings a lot of good qualities to the table. Despite the Terrain’s rugged-looking appearance, it actually drives more like a sedan than a truck. While the base engine rewards the driver with excellent gas mileage, it is outmuscled by the powerful V-6 engine. Even the base model comes packed with a number of convenient features. Prices for the 2015 GMC Terrain start at about $27,500. Prospective buyers will get the opportunity to choose from a few new colors. All versions of the Terrain now come standard with a 4G Wi-Fi hot-spot. The 2015 GMC Terrain comes standard with a 2.4-liter, four-cylinder engine. With a total output of 182 horsepower, the engine can easily move around the small SUV. This engine is certainly the best option for the drivers who are seeking good gas mileage. Future owners can expect to get about 23 mpg in the city and 32 mpg on the open road. The optional V-6 engine delivers a very strong performance on the road. When needed, the engine is able to push out a muscular 301 horsepower and 272 pound-feet of torque. Due to the extra power on hand, the Terrain’s towing capacity rises to 3,500 pounds. Like the four-cylinder engine, the V-6 version is also paired with a six-speed automatic gearbox. Most drivers will be more than happy with the Terrain’s front-wheel-drive system. However, there will be some drivers who will absolutely need the optional AWD system. While the AWD system really does not provide much benefit during normal driving conditions, it is a must-have necessity when traveling in the snow. GMC engineered the Terrain’s interior to be as quiet as possible. The SUV’s tight construction helps to keep wind noise to a minimum. The four-cylinder version is actually designed with a noise-cancellation system. While the standard suspension system delivers a very cushy ride, the Denali model is designed to deliver an elite level of comfort. Although the 2015 GMC Terrain is slightly smaller than most mid-size SUVs, it still provides an impressive amount of interior room. Everyone in the crew will have ample legroom. The sliding rear seat further enhances the SUV’s versatility. The Terrain offers impressive handling for a SUV. While the Terrain will never be mentioned in the same breath as a sports car, most owners will be very pleased with its driving dynamics. All trims come standard with one of the best stability control systems in the business. An OnStar emergency response system comes standard on every model. Even the base SLE-1 trim comes equipped with a rear-view camera and an auto-dimming rear-view mirror. Some of the optional safety features include a forward collision warning system, parking sensors, a lane departure warning system. Cross-traffic alert and blind-spot monitoring also come standard on the top-of-the-line Denali model. The 2015 GMC Terrain is a very attractive crossover SUV. The Terrain’s aggressive fender flares and rugged grille help it to stand apart from the competition. If desired, prospective buyers can also opt for a set of 19-inch wheels. Every trim comes loaded with an impressive amount of creature comforts. With a starting price of about $27,500, the base SLE-1 model proves to be an outstanding bargain. Some of the standard niceties include a rear-view camera, a touch-screen infotainment system, and a reclining rear seat. Although the GMC Terrain is a reliable vehicle, its 100,000-mile powertrain warranty will provide the owner with an extra ounce of security. A lengthy roadside assistance plan also comes with the purchase of a 2015 GMC Terrain. Although the GMC Terrain looks tough, it is not the most capable off-road vehicle. In fact, GMC does not currently offer a special off-road package for the Terrain. However, the available AWD system does enable this SUV to handle light-duty trails. When equipped with the potent V-6 engine, the GMC Terrain’s fuel economy takes a significant hit. Drivers can expect to get 17 mpg in the city and about 24 mpg on the highway. If fuel efficiency is a big concern, buyers should choose the four-cylinder engine. While the Terrain’s four-star safety rating is good, some of its rivals obtained a five-star safety rating. Some of the Terrain’s main competitors include the Honda CR-V, the Ford Escape, the Toyota RAV4, and the Jeep Cherokee. In terms of overall value, the Terrain is very competitively priced. While the Jeep Cherokee and the Subaru XV Crosstrek are more capable off-road machines, the Terrain is a more family-friendly vehicle. The 2015 GMC Terrain is an intriguing option for the families who are seeking a well-rounded vehicle. In terms of curb appeal, the Denali trim is clearly the cream of the crop. While the four-cylinder engine will save a lot of fuel, some drivers will find the V-6 engine's extra power to be irresistible. The SUV's high-quality interior and bevy of safety features make it an excellent family hauler. Search Dealer Inventories for the Perfect Used Car. 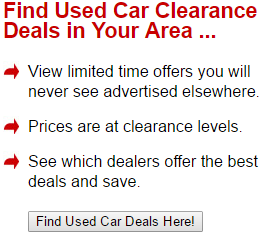 Search Thousands Of Used Cars Online. Compare Local Dealer Listings. Easily Compare Vehicles - Find the Best Deals. See who has the lowest prices & save. Learn what your car's worth before stepping foot in a dealership! About Extended Warranties - Should you buy one or are they a waste of money? Are You Thinking of Buying a New car?